We are Google Apps professionals that install and setup Google Apps for businesses and organizations. 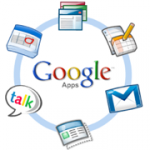 We are Google Apps professionals that install and setup Google Apps for businesses and organizations worldwide. Google Apps is a web-based hosted solution, which means you can access Google Apps at anytime, anywhere you have an Internet connection. This service, often referred to as “cloud computing“, allows users to access applications from the internet without needing the infrastructure that supports them. With Google Apps, your data and the applications themselves are served from Google’s highly secure, scalable, and reliable data centers. Your business is able to offload the infrastructure costs and the effort it takes to maintain an on-premises solution (such as Microsoft Exchange), and focus those savings on other initiatives. And since Google Apps is web-based, your employees can be productive from anywhere, whether they’re at their own desk, using a different computer, or on the go with a mobile device. A successful deployment or migration starts with careful planning and developing a deployment project plan that doesn’t impact the daily operations of your business or organization. By leveraging our experience with Google Apps Deployments you can rest assured that you will have a Google Apps Deployment plan that leaves you with a hosted email and collaboration solution that works and that your users will be able to start using immediately. We will explain the tools and options at hand for migrating mail, calendar, and contact data from your legacy platform to Google Apps. Please contact us to see how Google Apps could potentially benefit your business or to just learn more about Google Apps. Contact us to find out more about our Google Apps Deployment related services or simply to request a no obligation quote. Our Business Development Manager shall get in touch with you within 24 working hours.